Dreamy Martian projects and plans for the exploration of deep space with future super heavy lift rockets; reusable rocket stages that are landing with a phenomenal accuracy; imminent competition of private space companies; suborbital tourism — it’s all here in our stellar cocktail of high-tech romance! 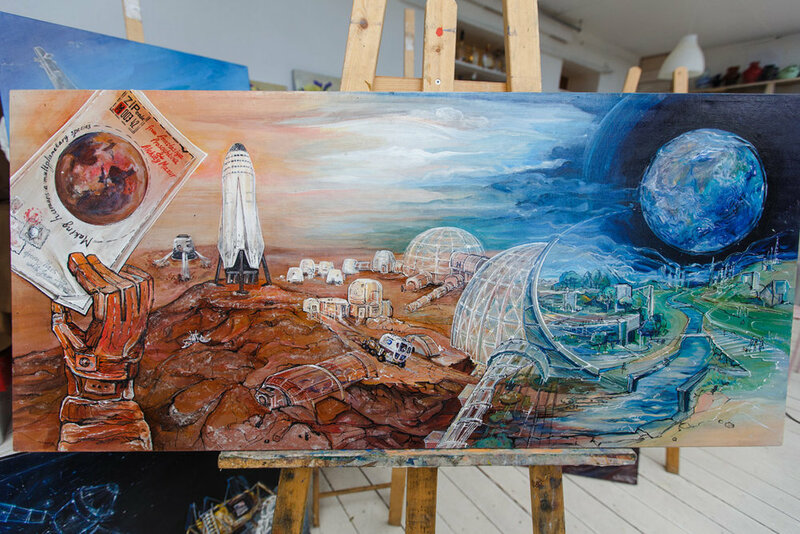 Anastasiya Prosochkina - Architect, artist, promoter of space exploration. Winner of various international drawing contests, participant of exhibitions in Germany, Netherlands, Austria and Russia. Aleksey Mazur - Bachelor of applied mathematics, flight dynamics engineer, promoter of space exploration, 3D Artist. The sophisticated algorithms of automatic control do not appear in the vehicle on their own. No matter how smart the rocket’s software is, it can only reflect the skill and talent of those who created it and the ingenuity of human mind. 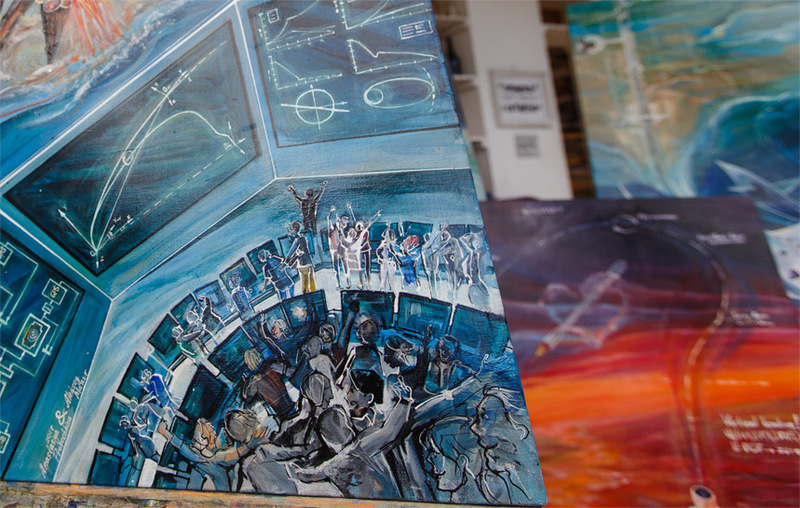 This painting is a tribute to all people who dare to implement challenging technical ideas no matter what. Propulsion, avionics, flight dynamics, software, operations engineers and many others come together to the SpaceX launch control center and watch with almost childlike joy how their creation soars into space, works in space and then returns to the Earth with a phenomenal accuracy. O my, this GIF is fast! Orion. Beyond the lunar orbit. 2035. Souls of the space conquerors of the past century are standing near the descent stage of the Apollo Lunar Module and observing how their courageous followers are getting ready for the new breakthroughs in space — for the first time ever man will fly beyond the lunar orbit, into deep space. Super heavy launch vehicle "SLS Block II" will send the crew of four aboard the Orion spacecraft to expand the limits of human reach, to rekindle humanity's pioneering spirit once again and to accomplish goals that no robotic probe can achieve. The first stage of the Falcon 9 rocket separates and begins its journey back home. Speed is more than two thousand meters per second, altitude is more than 150 kilometers. The stage makes a flip maneuver and prepares for the boostback phase. Carefully calculated burns slow down the vehicle and guide it to the drone ship in the illimitable ocean.Powerful thermal and aerodynamic load stress. Materials are working at the edge of its performance capabilities. High-precision control system is operating with the grid fins and cold gas thrusters to overcome disturbances. Suicide burn! The central engine ignites at the last moment, levels the stage under drone ship, the landing gears deploy and — perfect landing! Of course I still love you. Beautiful story of technology and romance. Thoughts of manned flight to the Mars have been taking people’s minds a long time ago, but only recently humanity has begun to make efforts and invest heavily in thoughtful development of these projects. We started from small space probes and eventually evolved to the heavy robotic rovers that are creating the foundation for a manned mission. That is why in the very near future humanity will be able to land on Mars and establish there a colony. Who knows, maybe it will be SpaceX with their Interplanetary Transport System project, who will make one of the first steps for making humans a multiplanetary species, turn Mars into another green planet, into our new home — this is the sequence we have illustrated. 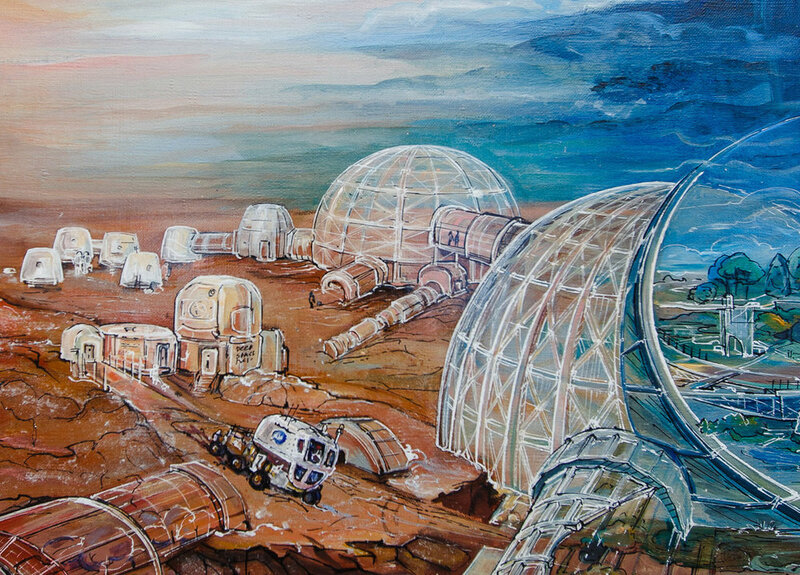 Colony in space invented by Gerard K. O'Neill. The large space station consists of two counter-rotating cylinders which provide artificial gravity. The people of the future will comfortably live, work and rest there. There will be a place for the entertainment activities that had never been known before, like flying in a low-g zone by using just muscle power. Imagine you are a bird, soaring over your space home! Blue Origin moves rapidly from the small suborbital rocket New Shepard to development of a large launch vehicle New Glenn with a payload about 40 metric tons. Reusable first stage, advanced methane rocket engines, landing on the ship in the ocean — this rockets will be the very embodiment of all the latest advances in rocket technology! Blue Origin prepares to become a major player of private commercial space: from orbital constellations comprised of hundreds of small satellites to sending cargoes to the Moon. Interesting approach to the concept of a suborbital tourism. Unique spacecraft SpaceShipTwo separates from twin-fuselage mother ship WhiteKnightTwo, takes run by the rocket engine in the back and reaches space. There, at altitude more than 100 km, lucky passengers can enjoy zero-g and watch a mind-blowing view of home planet for several minutes. Then spaceship makes a soft re-entry and come back to the one of the most beautifully designed spaceports — Spaceport of America. Despite its turbulent history, the project keeps going. Extravagant Richard Branson is confident about success!